As much as we hate it, summer does come to an end for most of us each year. When that happens it’s important to properly close your pool. Not only for safety’s sake but to save you money and time. An improperly closed pool is vulnerable to freeze damage, would could be very costly to repair. Here’s how to make sure you do it right. First, make sure the water is properly balanced and that the pH, alkalinity and calcium hardness are within proper levels. This should be done about a week before the pool is actually closed. You’ll also want to use a strong shock product to kill bacteria and fungi. A product that allows swimming right after treatment is not strong enough. Before closing the pool make sure the chlorine level in the pool is no higher than 3ppm. The final chemical to add is an algaecide. Make sure to use one that is meant to last over the winter. Neglecting this step will allow algae to bloom, which has a very foul odor and can permanently discolor your pool liner. When the water treatment is complete, it’s time to clean. Remove everything but the water, clean, and store away for the winter. This includes filters and hoses! Then skim the pool to remove any floating debris, and vacuum to remove any dirt and debris at the bottom. This should be done the day of the actual shutdown. The final step is to lower the water level to below the skimmer. 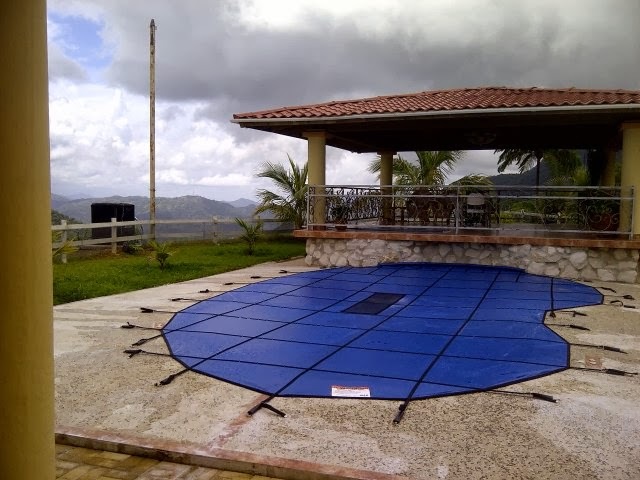 Depending on what variety of high quality pool covers you’re using, that would be about 12 inches below for mesh and 6 for solid. Finally, drain filters and other equipment, winterize the pool plumbing, and install your cover. Your pool is ready to wait out the winter!